The excitement of the impending birth of a baby is wonderful to share with your closest friends and family, and Baby Showers are now becoming more and more popular. Let us teach you how to make some beautifully decorated biscuits in keeping with new birth. Delightful Ducks, beautiful Bunnies and serene Swans all in pastel shades of Royal Icing with their little ones in tow. • supply you with 8 of our yummy home-baked biscuit rounds. • Teach you how to make Royal Icing ready to use on Your biscuits. • Show you how to use colour in your designs and how to adjust the shades. • Teach you how to make the borders and features in different colours ready to bring your characters to life. • We will show you how to adjust the consistency of Royal Icing for run-out (flood)work. 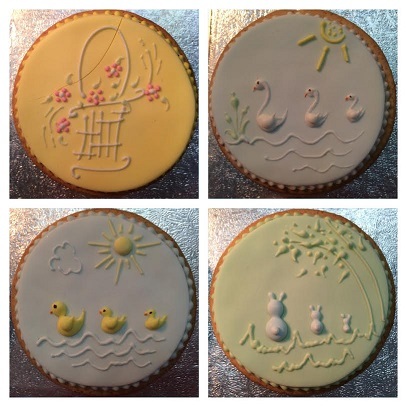 Then you will be able to finish decorating your biscuits with Chicks, Ducklings and Cygnets! A delightful and thoughtful addition to your baby shower. Be the first to review “Baby Shower, Royal Iced Biscuits” Click here to cancel reply.